Here in Bogota, Albert Luepnitz just finished another ministry tour in which a large number of military officers including top generals (retired and active) responded and were deeply touched by the Lord. Albert received military awards and honors from the Army, Air Force and the National Police and a ceremony is pending with the Navy. The first spiritual encounters have begun between converted guerrilla leaders and converted generals as they encourage one another with the testimony of what Jesus Christ has done in their lives. This cuts directly through the past fifty-three years of violence, hatred and mistrust. This is the beginning of a new day! Colonel Pedro Javier Rojas representing the Colombian Military and the Government came to meet with me at Russell’s Bogota residence in late January 2017. He and his wife were very gracious; and to my utmost surprise quickly spoke that he was selected to present a unique award to me. His coming was particularly heartwarming as he had been one that I had previously prayed for over the phone at Russell’s request. He was wonderfully healed. Now, before proceeding with his mission, Javier asked if I would also pray for his lovely wife who was in pain. Gladly I took her before the Lord and she was healed of the back pain after one leg that was 2 inches short grew out right before her eyes. Then the Colonel explained his actual reason for coming and apologized for being late. It seems that he was preparing to leave for China as the Military Adjunct to the Colombian Embassy. He related to my surprise that the Military had a dossier on me and I had become known as ‘The Paul of Colombia’. This was particularly fitting because of the award that he was sent to present. Then he read to me a passage of scripture concerning the Apostle Paul who was being referred to in the newly adapted Military Manual that was just released. It includes and explains their new directives and mission. This has a lot to do with Peace and Human Rights as the stated mission of the Military. He had autographed a copy of the Manual and in giving it to me explained that I was lovingly considered a special agent, ‘A Paul’ who has ministered mightily to our troops over the last thirty three years. It seems that my message of forgiveness and the ability to affect divine encounters have made a significant impact on Colombia. Javier said this also resulted in me being able to engage in the Peace Treaty efforts to help bring about a very illusive victory for all of Colombia. Then the Colonel with tears in his eyes proceeded to remove from his pocket a beautiful gold medallion which prior to me had only been given to Russell Stendal. It seems that the Colombian Army recently changed their entire doctrine or code of conduct that governs every person and every unit in order to adapt to the new period of post conflict. The new doctrine is named “Damascus” inspired by the conversion of Saul of Tarsus. 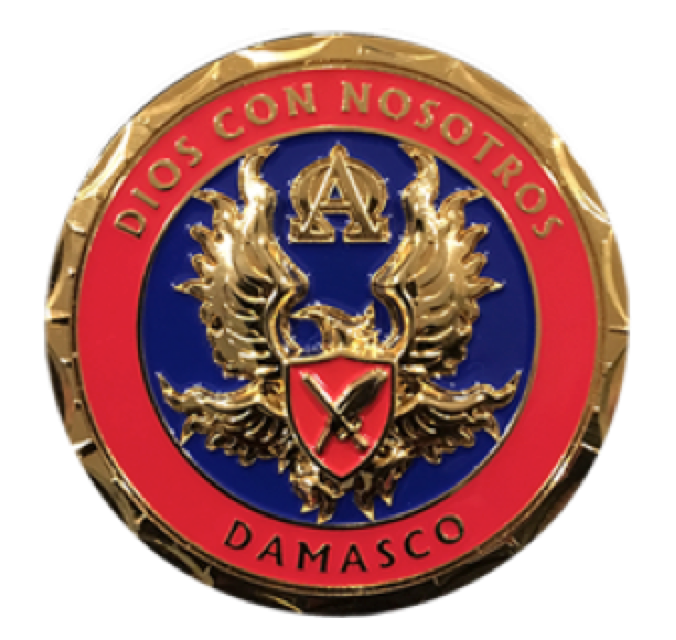 I was being awarded this special Damascus Gold Medallion for our successful work leading to the conversion of many. We continue to receive many testimonies from soldiers and police whose lives have been transformed, all glory to God. Albert is faithfully ministering to this day to gang members in Jacksonville, Florida and continues to travel to Colombia to pour out his life for Christ. He is an inspiration to all of us, at 91 years young, finishing well as a witness for Christ.